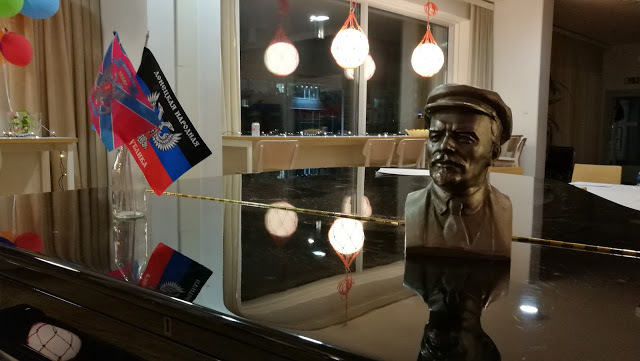 Right after Finland celebrated her centenary on December 6th 2017, Donetsk People's Republic opened her official representative center in the Finnish capital on December 9th, 2017. The event was very widely reported in Donetsk, Russian and Ukrainian media. The DPR representative center has official status in Finland since autumn 2016, when it was registered by the Finnish Patent and Registrations administration. Before that, since Summer 2014, Finnish representative was based on power of attorney from Donetsk authorities. Finnish authorities have nothing against the DPR representative, since Finland has a good tradition in supporting representatives of non-recognized states. Earlier for example East Germany (GDR) and Palestine had functioning representatives in Helsinki despite non-recognition. 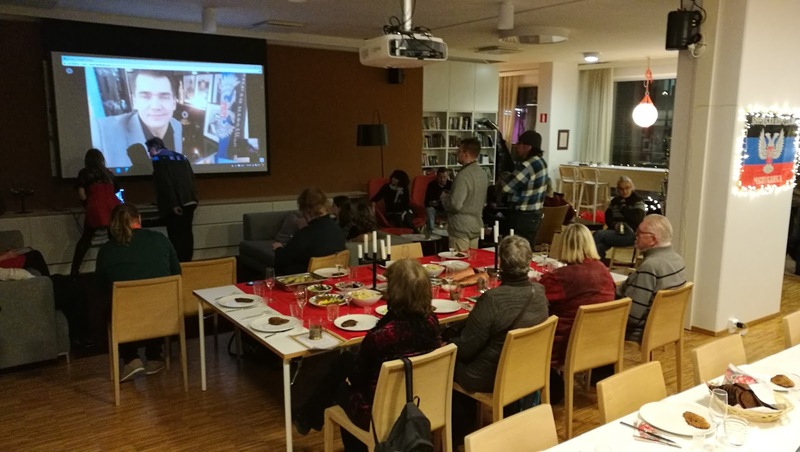 Finland had good tradition in supporting especially non-regocnized GDR. 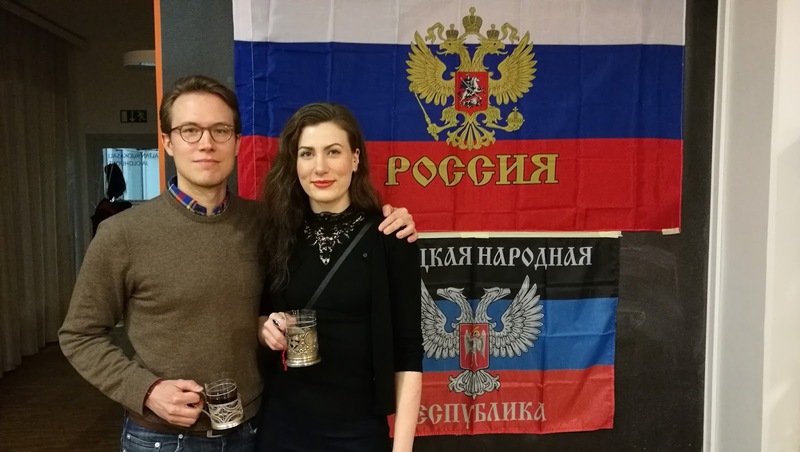 Not surprisingly many of those Finns who once supported GDR, now support DPR. This in fact means majority of Finnish intellectuals, most of whom are at least positively interested. 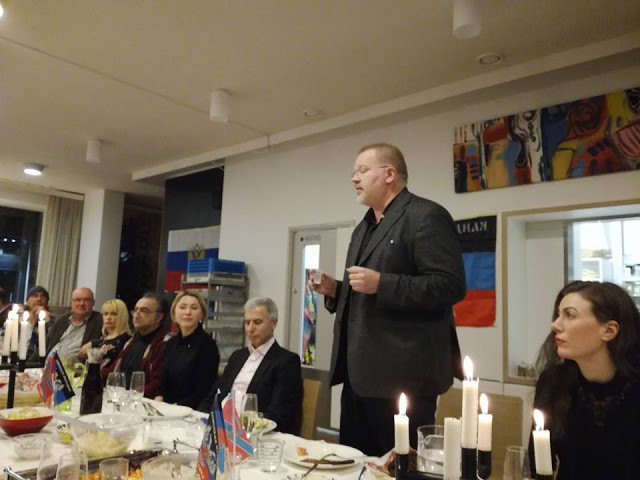 For Finnish authorities DPR representative is very comfortable for enstreghtening Finland's international position and supporting the Minsk peace process. Unfortunately, Finnish foreign ministry is temporary paralyzed, because after the split of the «True Finns» party, the new party of foreign minister Timo Soini («The Blues») has only 1 % support, thus Finnish foreign ministry does not have real mandate to represent Finns' opinion. The DPR representative already has organised tourist trips for Finns to Donbass and will continue in 2018. Also, several books have been published in Finnish and seminars and conferences organised, also with Nordic experts. The main achievement of the center this far is the fact that most Finns know about Donetsk People's Republic and accept her existence. Also, journalists write more respectively. DPR representative opened in good atmosphere with Finns from various fields of life and profession and various ages. An address by DPR foreign minister Natalia Nikonorova was read to the audience at the opening. 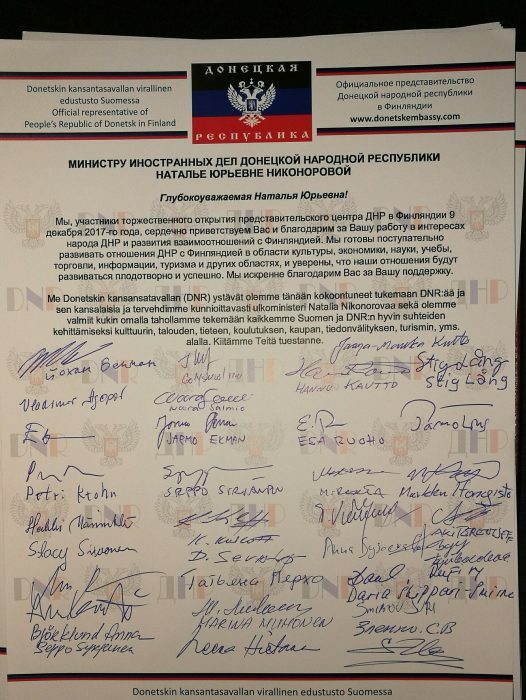 Nikonorova wrote, that «opening of the DPR representative center in Finland became and important step towards strenghtening information, cultural and economic ties between DPR and Your State.» In answer, over 30 Finnish activists from various spheres undersigned a letter of gratitude for the DPR foreign minister Nikonorova and promised to develop Finnish-DPR relations in the fields of culture, education, information, trade, tourism and others. 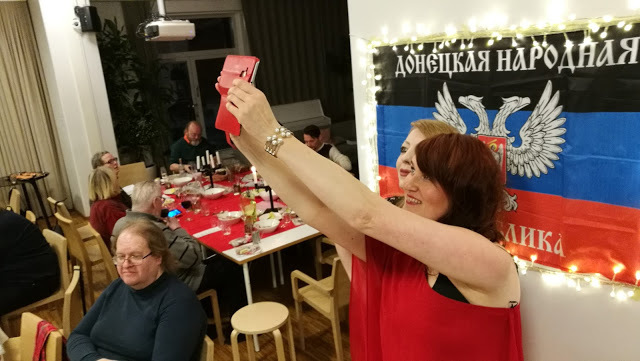 Employee of the DPR representative office and president of the Finland-Novorossia Friendship Society Ms Jaana-Marika Kurtti raised a toast for all friends of Russia, Novorossia and Donetsk People's Republic. 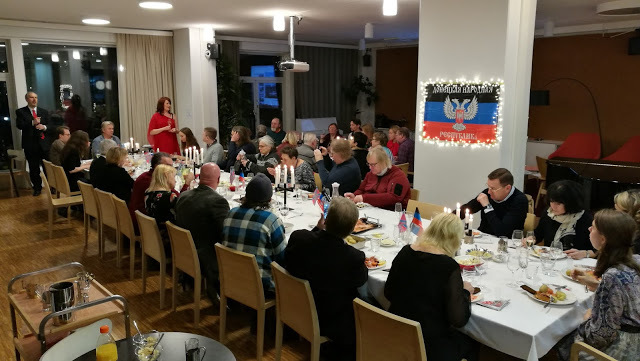 The Finnish friends of Donbass were really happy to sing Russian songs together in both Finnish and Russian languages. 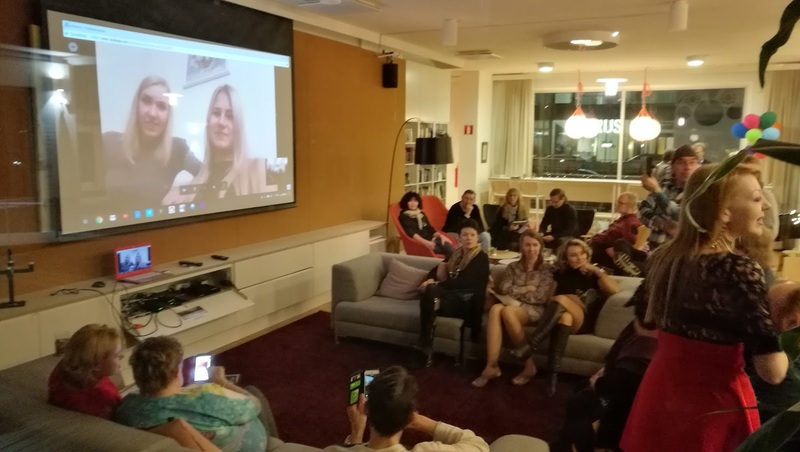 During the opening, a video link with Donbass was established with the Finnish director of the information agency «DONi» Janus Putkonen. At the evening, free debate continued in good spirits. 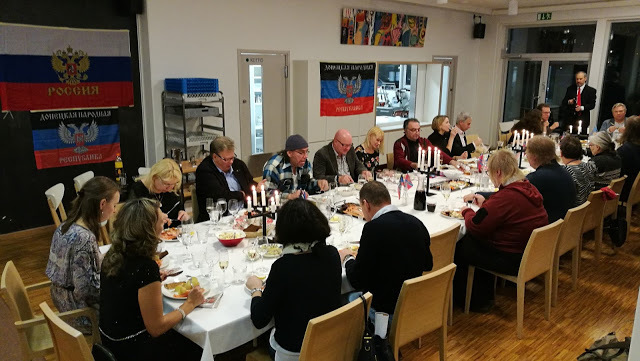 This entry was posted in News and tagged Donetsk, Donetsk People's Republic, Finland, Helsinki on December 11, 2017 by Johan Bäckman. This entry was posted in News and tagged Denmark, Donbass, Finland, Hybrid CoE, Hybrid threats, NATO, Norway, Sweden, Ukraine, USA on September 23, 2017 by Johan Bäckman. 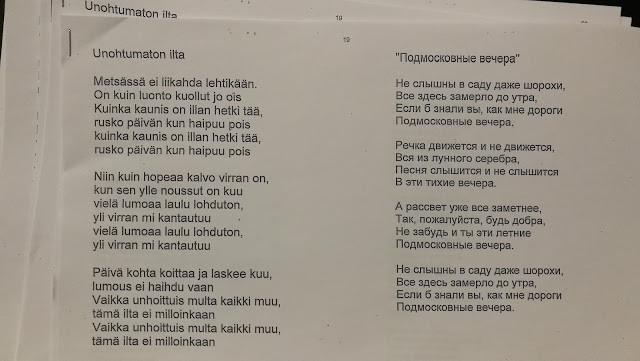 Tervetuloa Donetskin kansantasavallan Helsingin-edustuston virallisille sivuille. 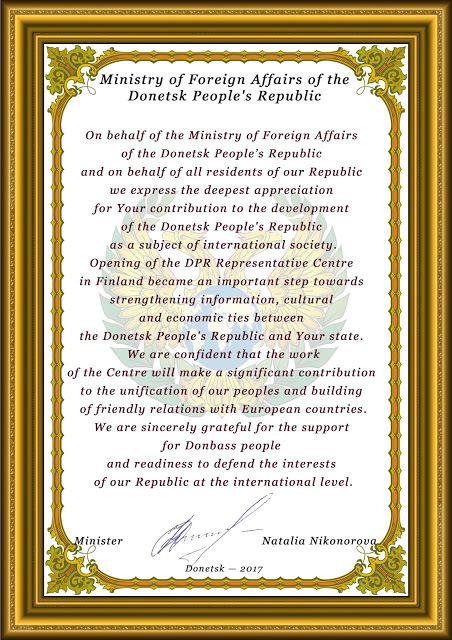 This is the official website of the Helsinki representative of Donetsk People's Republic. This entry was posted in News on September 6, 2017 by Johan Bäckman.